That's what I love about JJBA, though. Just when you think it can't get any weirder, it does. And now that think about it, since Dio stole Jonathan's body, that bone that he gave to Pucci is Jonathan's bone. That would explain why the baby had the Joestar birthmark. Damn I love this series. So I came back to this thread to say I just watched all six episodes of the Gunbuster OVA. Wow. That was awesome. It started off pretty mellow with not much action going on, but by episode 5 it reaches levels on par with Gurren Lagann. Made by the same guys, after all. And the main character, Noriko, went through the same type of character development that Simon would go through. Starts off as a crybaby who gets bullied by her high school peers, ends up as a courageous hero remembered even thousands of years later. In just six episodes. Oh, and Norio Wakamoto was in it voicing a major supporting character, so that's a huge plus. Yeah, I loved it. Definitely gonna watch the sequel after this. So, on a whim I decided to start watching the Macross franchise. I'm up to episode 11 of Super Dimension Fortress Macross. So far I'm enjoying the fact that ace customs don't seem to be quite as prevalent as in most 'Real Robot' anime, and the focus on the fact that the standard mechs, the Valkyries, spend most of their time in their 'fighter jet' modes. It's pretty enjoyable overall, and I plan to continue through the franchise. The characters haven't really done much developing at this point, although one of the bridge crew, Misa, got some good development of her backstory a few episodes back. On an unrelated note, while a bit repetitive, the music is pretty good. I've got a long franchise ahead of me... here's hoping it's enjoyable the whole way through. Similarly on the mecha front, I'm watching G Gundam. and yeah I've been wanting to watch Gunbuster & Diebuster for some time. They seem really cool. You can watch all of Gunbuster in roughly two and a half hours, so it's not asking for too much of your time. I think Diebuster's just as long, too. G Gundam is another awesome one. It's so absurdly over the top and cheesy that I couldn't help but love it. Still need to catch up on JoJo and Berserk. Currently archive binging the latter. Berserk is pretty good. I've seen some of it and my friend is a pretty decent fan of it. And yeah, I've just had trouble trying to find a way to watch Gun/Diebuster. Well, I'm all caught up on Berserk, and I can officially say it's my favorite manga, maybe even favorite work of fiction to come out of Japan. Now to agonizingly wait for the next chapter to come. Doesn't it take this guy like a year to release new chapters? Yeah, Kentaro Miura releases like two chapters a year if he's not on hiatus. Part of it's because he's a perfectionist. He takes his time to make sure the art's perfectly detailed and what not. I don't mind that at all, though. I'd rather he take his time and give us something of high quality, rather than hurry up and produce something unsatisfactory. Speaking of which, he released a new chapter just a few days ago. It just has to be translated now. Started Turn A Gundam. I always had this one on my list, and was always curious about it. Love the early 20th-century feel, and the characters don't feel like the franchise's usual archetypes, except maybe Harry Ord being a Char Clone. Last edited by Azure on Fri Aug 15, 2014 1:38 am, edited 1 time in total. I've heard Turn A sticks out a lot in the series for various reasons. Seems pretty cool but I think I want to be more familiar with the basic set up before I check it out. I was watching Mobile Fighter G Gundam with some online pals. Need to watch more of it but haven't really had a time when everyone was together. And there was a decent part in the middle where but interest was waning but that picked up toward the last six or so episodes. One thing I really like about the series so far is seeing the legacy the characters leave as it goes from one generation to the next. That's kinda funny how you like the first part better than the second. I usually see the other way around. Yeah, Hirohiko Araki was a little shaky on his writing in the earlier parts, so there's a few things like plot holes and one time powers that are never used again. He probably realized this and that's why part 7 onwards takes place in an alternate universe. Nonetheless, he really knew how to make a story enjoyable. I thought the villains were really interesting when I first read part 2, but I'll admit that Cars does pale in comparison to the other main villains in terms of how interesting he is. Lisa Lisa's role was definitely a big problem. I hear Araki wanted to put her into actual fights, but the editors just wouldn't let him. Such a shame. Thankfully, part 6 more than made up for that. That's something I like about JoJo too. The thing I like most about the series is that it really lives up to the title. It's about a guy named JoJo, he goes on an adventure, and bizarre is the understatement of the millennium when it's applied to this series. Part 7 is an AU due for publishing reasons. Originally it was a separate manga because his publishers at the time didn't want him continuing JoJo but eventually he moved to a new publisher and just made that part 7. At least, that's my understanding of it. The more interesting elements of the setting that could be explored through them like the history of ripple users and the masks were barely scratched. Also, I can barely define their personalities. its like, there's honor guy. there's power guy. and.... fire(?) guy. fire is a personality right? I was actually more interested by Santana but he was only there briefly. But, don't get me wrong, the fights were cool. ...That is correct. I forgot it used to be its own thing. Space Dandy's a really good show with a fantastic OST, great setpieces, and some hilarious comedic writing. I mean, it's just so good. I knew it'd be good from the get-go, but it's still surprising me how good this show really is even in the 10th episode of the second season. Reading Vinland Saga right now. I love the art style, and it's one of the most realistic portrayals of vikings I've seen. I'm liking it so far. I really should check that out, I've heard good things. I've just been watching Psycho.Pass season 2 and Parasyte myself. 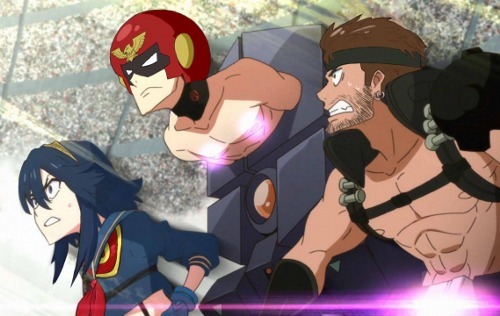 Recently went through all of Gurren Lagann for the first time. I've transcended. I finally understand. I finally believe. Started reading Vagabond. Another violent manga with incredibly detailed art that's still ongoing. It's awesome. Started watching Armored Trooper Votoms. I got so into Super Robots, I thought I'd check out a Real Robot series, and Votoms is as real as it gets. It's starting off pretty slow, but it's definitely picking up the pace as it goes on. I'm liking it so far. Also started watching The Big O. It's literally Batman if he used a giant robot instead of a batsuit. I'm also watching the English dub and it sounds fantastic. 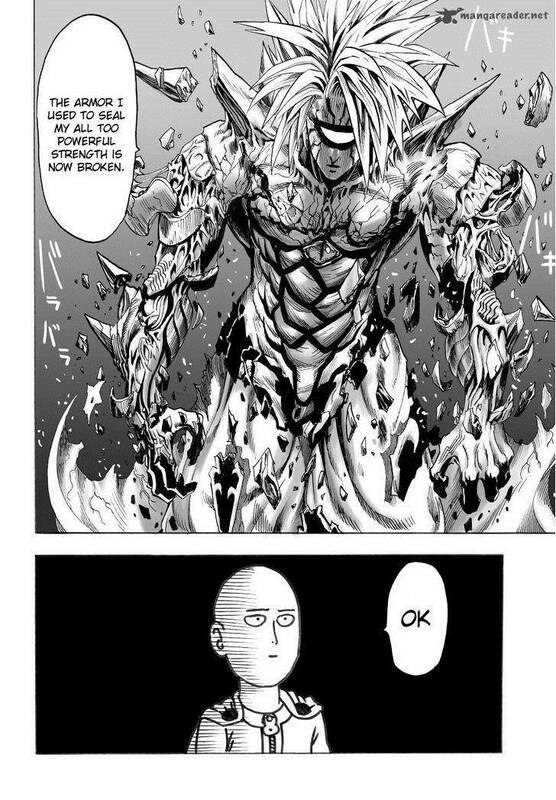 One-Punch Man speaks to me. I've been watching Monster recently. Holy crap, this show is amazing. The English dub is fantastic, too. Also, Berserk is resuming as a monthly series from now on. Very excited for that.